An American radio personality, television host, and liberal political commentator. Her syndicated talk radio program, The Rachel Maddow Show, airs on Air America Radio. Maddow also hosts a nightly television show, The Rachel Maddow Show, on MSNBC. Maddow is the first openly lesbian anchor to host a prime-time news program in the United States. 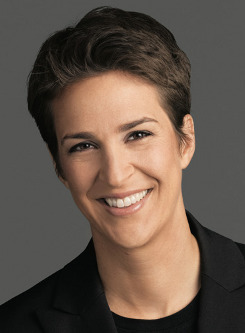 A graduate of Castro Valley High School in Castro Valley, California, Maddow earned a degree in public policy from Stanford University in 1994. At graduation she was awarded the John Gardner Fellowship. She was also the recipient of a Rhodes Scholarship and began her postgraduate study in 1995 at Lincoln College, Oxford. In 2001, she completed her Doctor of Philosophy degree (styled a DPhil) in political science from the University of Oxford. Her doctoral thesis is titled HIV/AIDS and Health Care Reform in British and American Prisons. She was the first openly gay American to win a Rhodes scholarship. Also in 2009, Maddow was nominated for GLAAD's 20th Annual Media Awards for a segment of her MSNBC show, "Rick Warren, Change To Believe In? ", in the Outstanding TV Journalism Segment category. In April 2009 she was named in Out magazine's Annual Power 50 List, landing at number 4. Maddow placed no.6 in the "2009 AfterEllen.com Hot 100" list (May 11, 2009)  and no.3 in their "2009 Hot 100: Out Women" version. Maddow is included on a list of openly gay media professionals in The Advocate's "Forty under 40" issue of June/July 2009. In June of 2009, Maddow's MSNBC show was the only cable news show nominated for a Television Critics Association award in the Outstanding Achievement in News and Information category. Maddow moderated the 5th Democratic presidential primary debate in 2016.